After an absense of 9 1/2 months due to having lots of bionic replacements in this aging frame I returned to my duties as a conductor. Albeit I only did one run and just over half a day. And at the moment that proved to be enough for the body although the spirit was more than willing to keep going. My train was the 1st shuttle and it was double headed by 14A and 8A and pulling 16 cars. Also operating on the day was 6A and 7A. 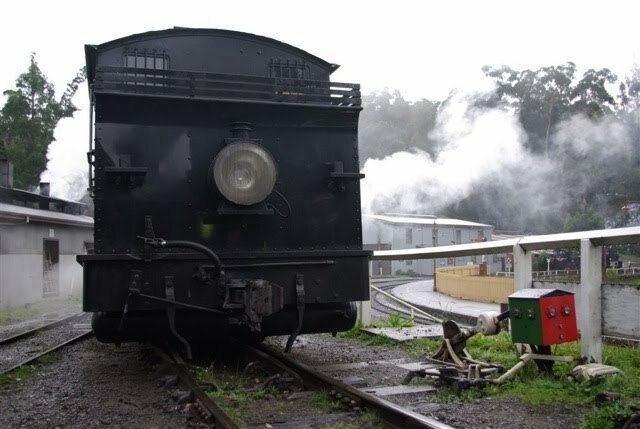 Most fortunately today they ran steam to gembrook through the Wright Forest. This is usually a no! no! at this time of the year due to our summer extremes and potential bushfire danger. A diesel hydraulic DH31 normally does the run in summer months providing the weather conditions are not extreme when no service operates to Gembrook. The 1st pic is 8A and DH31 in the yard. DH31 will be sometime in the future bere-numbered DH59 which was its number before joining the PBR. The 2nd pic is DH05 being restored and regauged for use on the PBR. It was supposed to be finished by the end of January to assist with the summer running. It has been painted in heritage VR blue and gold and is having its handrails fitted. 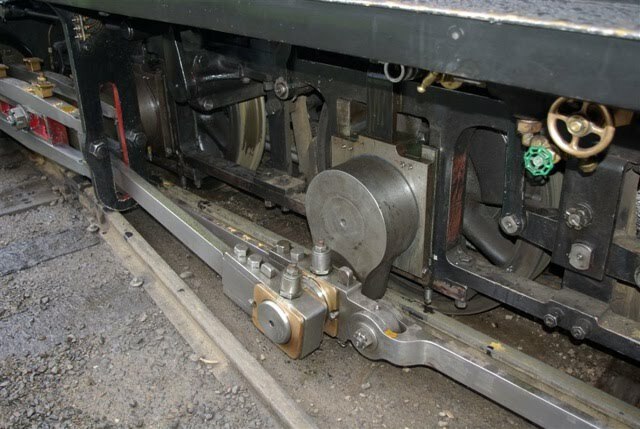 The bogies have been finished and are awaiting the wheels to come back from the Ballarat workshops where they are being re-gauged from 3'6" to 2'6"
The 3rd pic is 14A and 8A double headed in the platform at Belgrave. The 4th pic is 14A and 8A from the otherside. 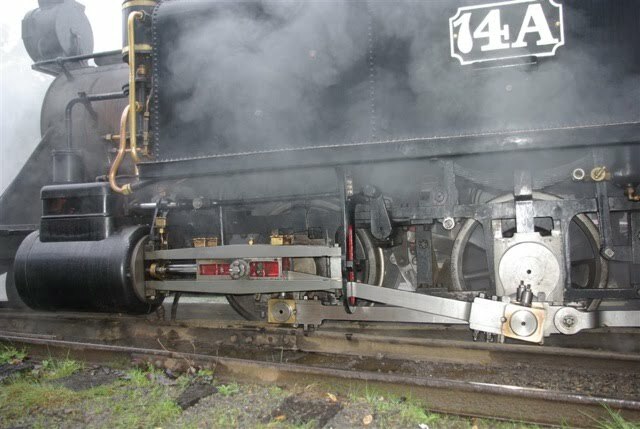 The 5th pic is 6A steaming in the yard. The 6th pic is 14A and 8A on the down train crossing the Monbulk Creek trestle. 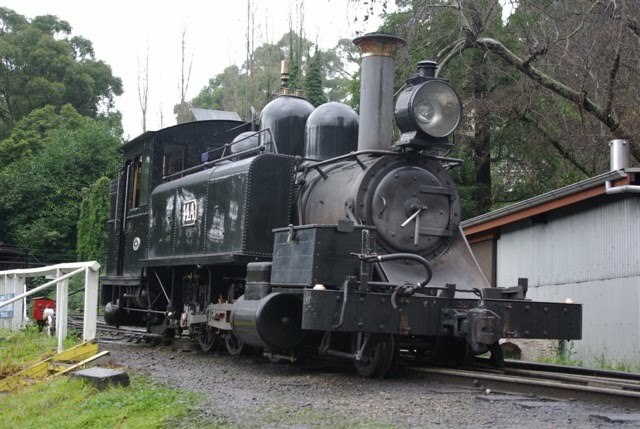 The 7th pic is D21 a diesel electric ex Tasmanian Railways re-gauged as a work train at Lakeside. They were cutting back and mulching trees. The mulcher is in the NQR truck. A lopped tree has fallen across the front of D21 obscuring the view of the 5 chime horn. 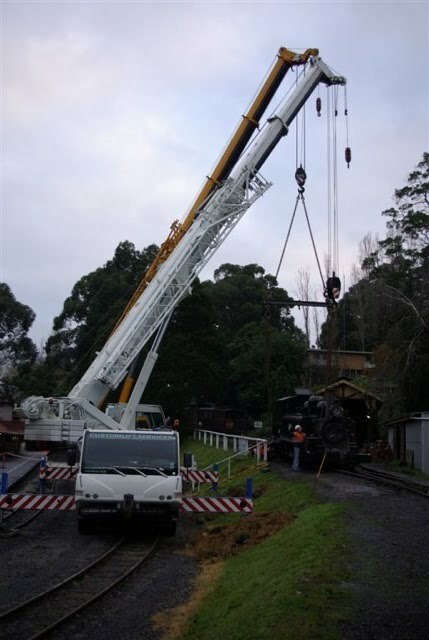 The 8th pic is 6A on the down train to Gembrook at Lakeside. My train is on platform 2. The 9th pic is 8A and 14A on Horseshoe Bend up from Lakeside. The 10th pic is 7A down to Lakeside at Menzies Creek. The last pic is 8A and 14A on the up train, almost home crossing the Monbulk Creek trestle. Not PBR but this is a B class see my comments below. 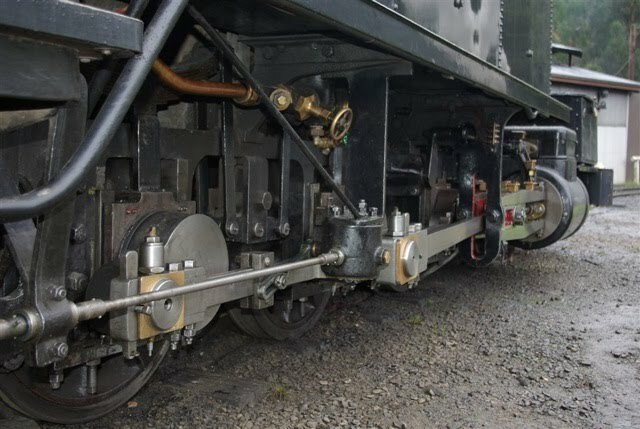 8A in steam, 7A to the right, behind the boiler on the truck 14A. The boiler, smokebox and diamond stack belong to Climax 1694 reputably the last Climax manufactured. 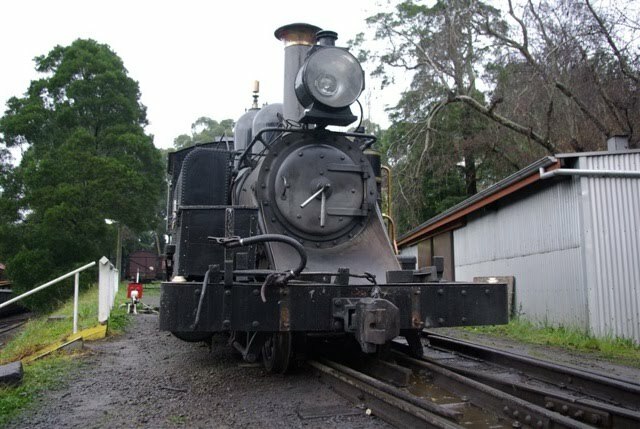 It is 2'6" gauge and was purchased by the Forst Commission and used to feed timber in the East Gippsland area to the VR narrow gauge. 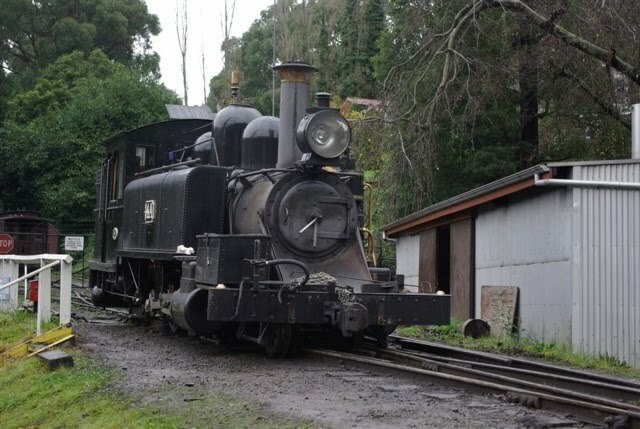 It lay idle in the bush for many years and was transferred on assetts register to Puffing Billy. 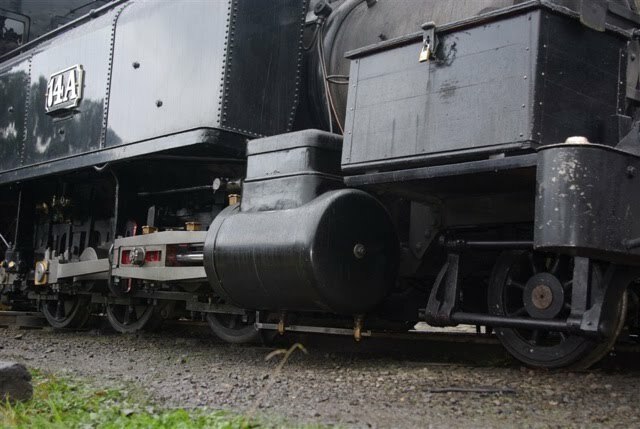 Here is a closerpic of the boiler. This is my train for the day. My favourite 8A. The wheels from for diesel hydraulic DH05 have arrived from Ballarat and are being turned on the copy lathe. This is from an email sent to me from Grant in late May. The derailment occurred on a Tuesday and the railway was closed for the Wednesday when these photos were taken. You probablyheard all about this but may not have seen any pics. It took two mobile cranes sitting on the tracks in front of the station to get 14A back on track. Where 14A derailed is in the roads which are used to store the carriages. As you can see these are on a hill which was the original right-of-way when Puffing Billy operated back to Ferntree Gully on the UP side. I bet the driver felt silly. It is usual practice for the guard to set the points. They would have needed a lot of jacks to get that back on.